The Global Opportunity Reports demonstrate that behind every risk there are opportunities. The reports aim to catalyse action and collaboration to address the great sustainability challenges that society faces today. The publications were created in partnership with DNV GL and United Nations Global Compact from 2015 to 2018. Businesses have always been adept at identifying and avoiding risks. However, in order to achieve the ambitious Sustainable Development Goals, businesses must be able to look beyond the risks, and see where the new opportunities lie. This is one of the greatest challenges facing businesses today. The Global Opportunity Reports demonstrate the importance of turning risk to opportunity, and show where business can make a difference in addressing the Sustainable Development Goals. In creating the series, we interviewed over 17,000 business leaders, of all types around the world – from CEOs of established corporations to start-up entrepreneurs – and invited them to come up with business solutions that tackle the world’s biggest risks. Each publication has its own focus where several risks are highlighted as well as the corresponding opportunities. 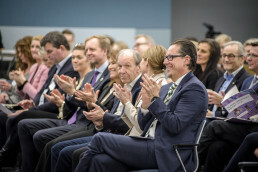 The four publications all had their own launch event where business leaders were invited to partake in discussing the opportunities behind the risks. Click here to read the 2018 Global Opportunity Report. 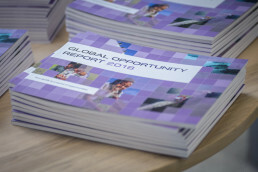 The Global Opportunity Reports were created by Sustainia together with DNV GL and UN Global Compact.